June 27, 2017 – The NWS Director, Dr. Louis W. Uccellini, announced a new space weather model, the Geoelectric Field model, today. 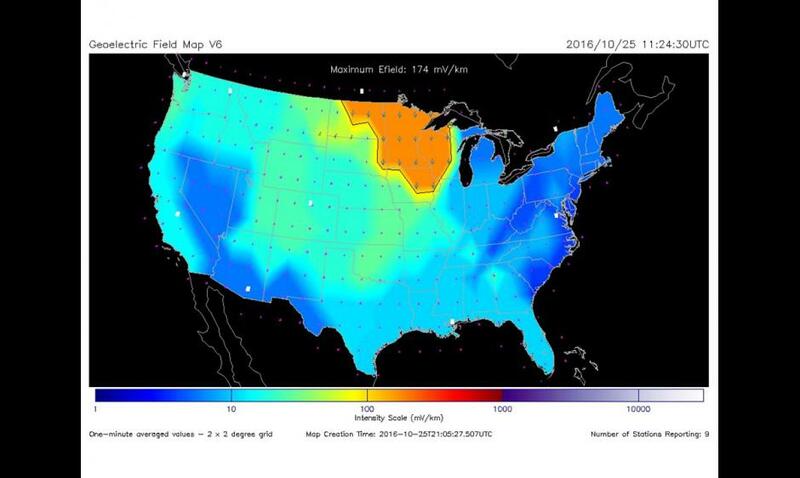 It was developed by NOAA, in collaboration with the USGS, NASA, and Natural Resources Canada, to provide real-time situational awareness of regional electric fields generated by disturbances in Earth’s magnetic field. There is a very small continuous flow of natural electricity through rocks and soil on Earth. This electrical current — created by changing magnetic fields in outer space and in the atmosphere — is usually harmless, but during a geomagnetic storm, things can change quickly. When magnetic fields and particles from the Sun interact with the Earth’s magnetic field, strong electric currents high in the atmosphere can create induced currents in the ground. The size of the electrical currents generated depends on a number of factors, such as the local bedrock type and the amount of water contained in the soil, but the ground currents can become large enough to cause disruptions to technology such as high-voltage power grids, railway switches and long pipelines. In the case of power grids, voltage collapse and blackouts can occur. Access to the Geoelectric Field model calculations will provide key situational awareness to electric grid operators and allow for the development of important tools for power grid control centers. This will enable better protection of infrastructure and technology. The model will be running experimentally starting this fall and is expected to be operational in 2018.